Blogdorf Goodman: Feed Your Skin! It's no secret that I am frustrated with my super-dry skin this Winter, and with Prescriptives for going out of business and leaving me wondering what I can use to alleviate the dryness and discomfort I'm experiencing now. 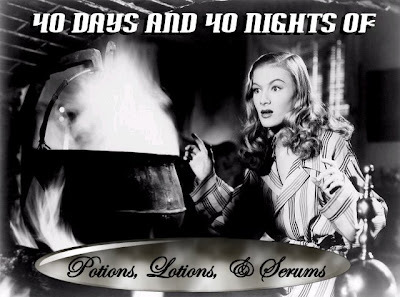 Nothing has seemed to relieve the tightness, flakies, and parched, dull appearance of my complexion. I've layered products and slathered on the creams, and I even dug out my little sample of Creme De La Mer, which didn't help, either. I've re-applied my regular facial moisturizer throughout the day, and I wake up in the morning with a face as dry as a sheet of paper. A few weeks ago, I took advantage of a day without snow, and took my Mom to our favorite grocery store to stock up on provisions before the next blizzard would hit. While she was gathering her weekly stock of magazines, I wandered off to the skincare aisle a few steps away. Our grocery store has a nice way of calling attention to anything new, with a big red "NEW!" tag on the shelf right below the product. Spotting the tag on the L'Oreal shelf, I saw this Age Perfect Hydra-Nutrition, which I had seen on the L'Oreal website a few days before and did not dream I would find so soon. On the box, I read the words "For Mature, Very Dry Skin" and into our cart it went. I tried it out that very night. While it was snowing. So far, in our 40 In 40 Skincare Project, you've seen me rave about the L'Oreal Age Perfect Serum and the Skin Genesis Complexion Equalizer. I am about to rave even more. This new Age Perfect Hydra-Nutrition has met every possible Winter skincare need I have had, has exceeded all expectations, and outperformed all other creams I've ever tried in order to alleviate the dry and uncomfortable skin I have been experiencing this Winter. No wonder this cream works so well, the first ingredient is water, and that is followed by mineral oil and glycerin. It also contains shea butter, which is known to be super-emollient and soothing, beeswax, apricot kernel oil, corn oil, royal jelly, and rice bran oil. It's a very thick vanilla-colored cream with a soft and fresh lemon-herb scent which does not bother me at all. I like it. After cleansing my face at night, and applying my Age Perfect Serum, I smooth on this lovely cream and feel instant relief from the dryness. My face feels nourished, supple, smooth and comfy. Flakes disappear, tightness is relaxed, The formula is so rich that just a little goes a long way. This is serious stuff, and it has healed my dry skin problems, and I am thrilled with it. I wake up in the morning with soft, supple skin and I have not noticed any clogged pores or skin problems whatsoever. I do have to say that I am pretty sure that when and if Winter ever ends in Ohio and Spring arrives, I probably won't need a night cream this rich. But for now, my grocery-store-shelf find has been the comforting, soothing skincare miracle I have needed. Febuary will soon be over. March is on the way. Spring is scheduled to arrive in less than a month. When the weather changes and my skin gets back to normal, I will tuck this jar away 'til next Winter. If there's any left in the jar! Hi Annie - I am in north central Ohio and am 44. My skin is also dry ( with monthly breakouts on my chin). 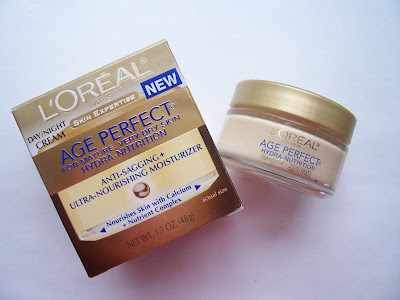 I use the L'oreal night cream in the blue jar - I think it's from the Age Perfect line. Their Age Perfect foundation is also very nice. I am in Northeastern Ohio. This has been a beast of a winter. Today we finally have some sun!!!! L'Oreal skincare is vastly underrated. It is a drugstore gem. Winter is the worst for me: I have super sensitive reactive skin, and rosacea. Few products work well enough for my skin. I found this in a Rite Aid in December, and fell in love with it. This is a superb product for aging, dry skin. No issues with it at all. But it is hard to find: many stores and outlets don't carry it. So I have a backup jar in my closet... just in case! Its winter here in Australia. And this is the perfect product for me.